Mites on gerbils can be a nuisance and are often difficult to fully eliminate. Mites may carry diseases and can lead to a number of skin conditions if left untreated. For this reason, it is essential that mites be dealt with as soon as they are noticed. If you see your gerbil scratching more often than usual, or if you notice any tiny red bugs on your gerbil or in its tank, mites are probably to blame. Check for the presence of mites by wrapping the gerbil in bath tissue (except for the head) for a few moments. Look closely at the bath tissue. If you see red spots or specks of moving dust, the gerbil has mites. Remove any gerbils from their cage and place them in a temporary enclosure. Spray the contents of the gerbil's cage (including the old bedding and any toys) with a pyrenthin mite spray with a concentration of .66 percent. This spray can be purchased from a veterinarian or at a pet store. Remove the old bedding and place immediately in a garbage bag. Close the garbage bag and spray the outside of it with the mite spray as well . Mix a small amount of bleach with water to create a mild bleach solution, and use it to thoroughly clean the cage. Add new bedding to the cage, and spray this with pyrenthin mite spray. Replace the toys and food that were in the cage. Spray the gerbil with the pyrenthin mite spray, making sure to saturate the fur. 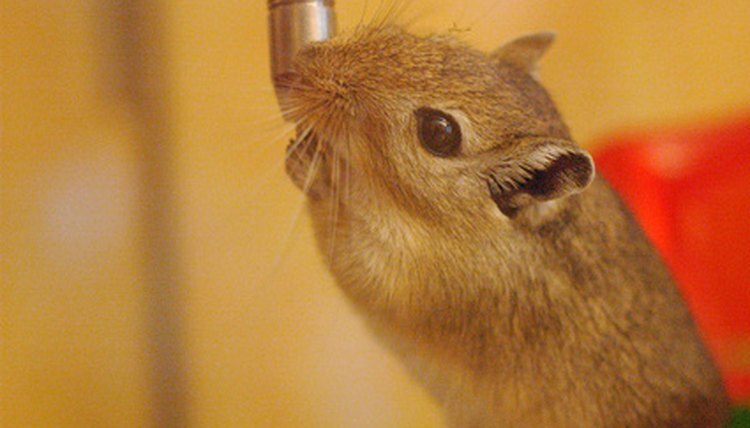 Start at the base of the ears and spray down towards the tail, avoiding the gerbil's head. Spray the mite spray onto your hands and gently work it into the fur on your gerbil's head. Be thorough and allow the spray to reach the gerbil's skin. Repeat the bath tissue test daily to ensure that the mites do not return. Repeat all of the above steps until there are no more signs of mites. This process may take several repetitions to complete. Always handle gerbils with care. Avoid getting any pyrenthin spray into your gerbil's eyes. What Can I Put in My Hamster's Cage to Get Rid of Bugs?